There is a masterly summary paper1 by the Kunz group at U. Regensburg of the type of hydrotropy that might equally be called (co)solvency. It shows, for two hydrophobic dyes, a monotonic increase in solubility with additions up to 13M of molecules that might be thought of as classical solvents such as propanol, acetone, ethylene glycol and propylene glycol propyl ethers as well as a classic hydrotrope (up to 2M) sodium xylene sulfonate. At ~10M, for example, acetone is ~73vol% which most of us would think of as acetone diluted with water rather than a "hydrotrope solution", but of course the "hydrotrope" definition is perfectly acceptable as long as one is clear that this definition is different from the "surfactant" mode (which often gives strong solubility enhancements at 1-5wt% surfactant) and "small molecule" mode which generally plateaus by 3M. My instinct, from my background of interest in Hansen Solubility Parameters, is to consider the above molecules (other than the SXS) as a classic solvent blend for which HSP has a long history of success; the solubility depends on the HSP "distance" of the solvent blend from the solute and the HSP of the blend itself is the vol% average of the HSP of the individual solvents, in this case water + acetone, water + propanol etc. The Kunz approach finds a respectable correlation with the "hydrophobic molar volume" of each solvent which, presumably can be mapped onto the relative proportion of dD (van der Waals) to dP (Polar) and dH (Hydrogen Bonding) within the HSP scheme and therefore onto HSP distance for a given solute. Which approach should be adopted is partly a matter of taste, though it is worth noting that one of the key insights of the HSP approach is that the combination of two bad solvents can produce a good solvent: in other words instead of a monotonic increase in solubility with addition of another solvent to water one might (for specific solutes) find a maximum solubility at some intermediate value of the solvent. This maximum cannot be explained by simple hydrotrope explanations nor is it the small-molecule hydrotropy which gives a plateau rather than a maximum. An alternative and powerful scheme for describing such mixed-solvent effects is COSMO-RS which the Kunz team use in other contexts. As the paper makes clear, molecules such as propylene glycol propyl ether can participate in another type of hydrotropy, i.e. increasing the efficacy of the surfactant mode. Again, whether you call this "hydrotropy or hydrotropy" or you think of the molecules as "cosurfactants" (names often applied to molecules such as lauryl alcohol or myristic acid in conventional surfactant discourses) is, once more, a matter of taste. Again my instinct is to stick to a surfactant nomenclature; the effects of such molecules on the CMC of surfactants is (as the Kunz team point out) well-studied, with one well-known mechanism being to help separate the charged heads of ionic surfactants and therefore to allow micelles to form at lower concentrations of surfactants. 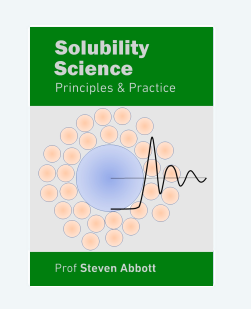 In general, as seen in the surfactant app, lowering the CMC gives an immediate boost to the solute solubility simply because there are more micelles at a given surfactant concentration and therefore more chances of providing solubility (usually) in the interfacial region. Of course the added molecules might influence this region in a manner to further increase solubility. The point is that as long as everyone knows what they mean when they say "hydrotrope" (as the Kunz group do in this paper) and if a "hydrotrope" analysis provides deep insights (as this paper does) then things are fine. However, because the hydrotropy literature is riddled with confusion because of sloppy notation, it is my preference to classify effects by their prime cause. So I would classify the type discussed here as "solvents" and use an HSP (or COSMO-RS) analysis and the effects with surfactants I would describe using surfactant mode or, a further possibility depending on circumstances, microemulsion mode.